Jerry Cornell is an agent for British Intelligence. He had been an agent for some time for a branch of Intelligence called Cell 57, run by Commander Ronald Fry. This division used as its cover the National Insurance, Ltd, an actual insurance company that enabled the agents like Cornell to have legitimate and verifiable covers as they traveled the world on missions. Cornell was a tall, dark haired man with ruggedly good looks and an insouciance that was both alluring and annoying to women. Further description of his is best taken from an early comment in The Chinese Agent, namely, "Everything about him gave him, in fact, the appearance of a man-about town of five years ago - a man about town who'd had one hole-and-corner love affair too many, one all-night gambling game too many, one bottle of Teacher's Scotch too many." The two-book series about Jerry Cornell is a light-hearted play-up of spy novels, filled with humor and unwilling to take itself or its genre too seriously. There is no slapstick humor or silly pratfalls; the plots are well defined and well executed but there is no doubt that the author was having more than a little fun with the books. The more remarkable aspect of this series, however, lies in its pedigree. It lies in two Parts. In 1965, a gentleman named Roger Harris was hired to write a book about a spy named Nick Allard. The book was to be called The LSD Dossier. Apparently, the result was less than desired and Mr. Moorcock was brought in to ghostwrite it. He did so but the original author's name remained. Then Mr. Moorcock was given the opportunity to continue the series, under a different pseudonym, Bill Barclay. Then a few years later, he was able to take the second book in the series, first under the Barclay name, and republish it. 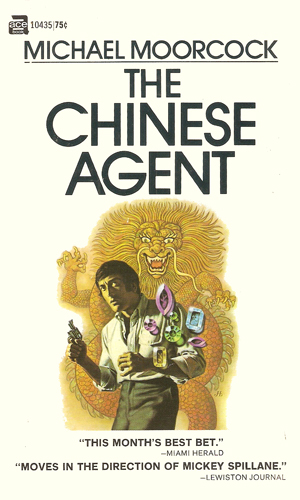 He changed the names of the key characters and added a new chapter at the beginning but otherwise the first Cornell book, The Chinese Agent is the second Allard book, Somewhere in the Night. Ten years later, or thereabouts, he took the third Allard book, Printer's Devil, changed the names of the characters again, and released the second and final Cornell book, The Russian Intelligence. Except for the extra paragraph and the name changes, these two book/series are the same. The latter is fairly easy to obtain in used book stores at a decent price. The former series, about Allard, is extremely rare and copies routinely cost well over $100. 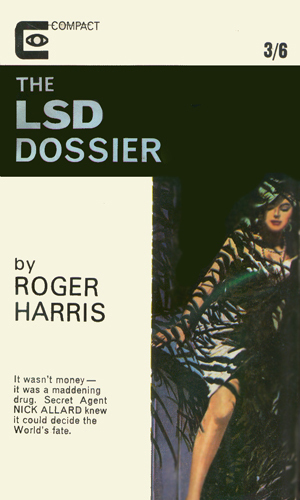 Interestingly, the first Allard book, The LSD Dossier, is available on the web in PDF format for free. Reading it and then reading the two Cornell books, it is easy to see that they are, in fact, the same character, including working for the same legitimate albeit low-key insurance agency as a cover. 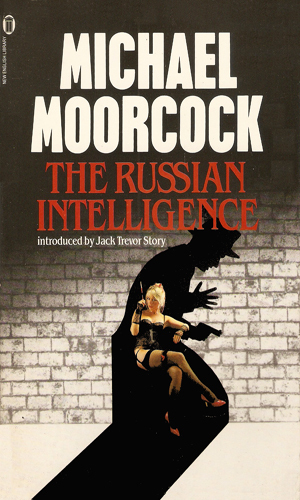 In 1968, a couple years after he had written the Nick Allard series, Mr. Moorcock created an interesting tour-de-force about an English secret agent, adventurer, time traveller, anarchist named Jerry Cornelius. The book was called The Final Programme and dealt with Cornelius fighting with his brother who had kidnapped his great love. The story ends up with Cornelius being merged into one body with the evil Miss Brunner. Four years later, he would continue the series with A Cure For Cancer (1971), The English Assassin (1972), and The Condition of Muzak (1977). In these stories, Cornelius is many things but not a spy and he lives in many places and times but not now and not here. Meanwhile, from the publishing of the first Jerry Cornelius novel to the first Cornell novel, less than two years would pass. Is the character the same? Apparently not though they might be, or just might be related. Certainly, in the first chapter of the Cornell book to be about Cornell, he is asked if his name is Jerry Cornelius, which he denies and corrects to Cornell. But the author on his website won't clear up the matter, showing up that the author hasn't lost his touch when it comes to making the reader think. To add to the confusion just a bit, the two books in the Jerry Cornell series were re-released as an omnibus entitled Jerry Cornell's Comic Capers though it is often listed in the Jerry Cornelius section of Michael Moorcock's books. Mr. Moorcock has in his mythos the concept of an Eternal Champion, a man who lives many lives championing the side of Good against all manner of Evil. Both Jerry Cornelius and Jerry Cornell, along with Elric, Corum, and others, are incarnations of this Champion. The original Nick Allard adventure. Trouble is brewing in a Central American nation under the threat of rebellion which did not have overly concern Allard but it did his boss as it was the only country in the region pro-British. The thief was in London to steal the Crown Jewels when he is mistaken for a Chinese spy and given a packet of documents. Now he is being hunted by both the real enemy agents and Jerry Cornell who has the job of getting the documents. Finding the dead body of a fellow agent, Jerry Cornell is curious why the deceased had clutched in his hand a comic strip. Investigating, he lands in the world of comic books crazy spies and crazy writers are hard to distinguish. I first read Michael Moorcock when I was 19, in the Service overseas, and able to drink lots of whatever I wanted. It helped to understand much of the first Jerry Cornelius book, although the ending will creep you out if you have embied as much as I had when I got to that part. 40 years later, I tried again to read that book, 20+ years after giving up drinking, and I haven't a clue what it going on. The same cannot be said for the first Jerry Cornell book. This is a send-off of spy books but it is by a genius writer who knows that over-the-top usually means out-of-bounds. He never goes the first so never ends up the second. Mr. Moorcock is a truly great writer and storyteller and deserves the adulation he has received over the years. I will gladly take Jerry Cornell. I will gladly leave Jerry Cornelius. Ah, youth, where hast thy gone?